There are two departure lounges located after Immigration. Adinkra which is managed by Aviance and Akwaaba under the management of AHS Menzies. There is a general seating area with a duty-free shop and bars for passenger. In addition, the State Protocol Lounge is used by Senior Government Officials/Diplomats and VVIPS. An information desk is available in both terminals of the airport in both arrival and departure halls. The reception staff can inform travelers and companions on their flight, their experience at the airport or the formalities. Do not hesitate to call on them. Holders of international credit cards (Visa, Mastercard) or of cards delivered by local banks have the ability to withdraw money from the ATMs in both terminals. These ATMs distribute ghanaian cedis (GHS, GH₵) banknotes. Three airport lounges, open 24/7, are available for travelers seeking the comfort of a lounge to await boarding. Located in the departure halls of Terminal 2 and new Terminal 3, their access is restricted to business and first class travelers of some airlines, to access card holders and to passengers paying a one-time subscription fee. Access to wifi, to bar / snack, to television and to international press allows guests to spend a pleasant moment before takeoff. Ghana has several 4G operators selling SIM cards without subscription and 4G USB sticks for a cheap and fast internet access on your PC, tablet or phone. These SIM cards are available and can be activated in several shops in the airport. The terminal also has several wifi spots including that of lounges. Many shops are available in the airport, in the international duty free area as well as in the main halls of departure and arrival. Books, international newspapers, souvenirs, jewelry, handicrafts, ready-to-wear, postcards and stamps, phone and electronics, perfume, alcohol and tobacco are proposed to travelers. To send letters, postcards and parcels, for purchases of stamps and for receiving and sending money orders, the post office of Kotoka Accra international airport is located in the northern zone of the airport area, near Emirates Sky Cargo. Kotoka Accra International Airport is always concerned about the safety of passengers and aircraft. The police of the airport listen to all travelers. Security officers also ensure compliance with international standards. You can call them to report any suspicious activity. In addition, we remind you that leaving luggage unattended can cause its destruction and prosecution against you. To strengthen and protect your luggage from bumps, scratches or theft, a paying luggage wrapping service is available in the check-in area of Terminal 3. A wrapping station is proposed to passengers. Each airline flying to Ghana impose a different baggage allowance. It is important that every traveler comply with those rules under threat of being required to pay excess baggage fees that can be prohibitive. It is therefore recommended to weigh your luggage before you get to the airport. However, it is possible to weigh them on the balances available at check-in counters in order to lighten them if necessary. Just like checked baggage, cabin baggage must meet a maximum size and weight. Airlines propose in the check-in area boxes to check if your cabin baggage meets the standards. Some passengers try at the time of boarding to carry more or different bags that those validated at check-in. They are exposed to leave their bags at the airport or to pay excess baggage fees in addition to delay the takeoff to the detriment of all travelers. Passengers who have not had the time to buy their tickets or have missed their flights have the option to purchase a ticket at the airport (at generally higher rates). Correspondents of different travel agencies and airlines can offer these services. For medical care and other medical related issues, the Airport Clinic is situated 500 metres from the terminal. The facility offers the following services: dental, physiotherapy, paediatric, gynae, The Airport Clinic is open to the general public and provides a 24hrs service. Furthermore, a pharmacy is available in Terminal 3. 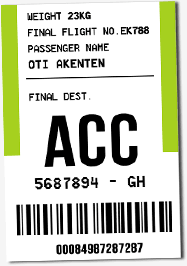 If you have lost something during your stay at Accra Kotoka International Airport (AKIA) you can find help at the Lost and Found Office in the arrival hall. The office provides lost property registration, storage, enquiry, and retrieval services for items lost in the terminals or during your trip. Kotoka Accra Airport has bars / restaurants in both Terminal 2 & 3, in public and boarding areas. You can eat there or consume various beverages, soft drinks and mineral waters.